Just saw this company posted on Colossal and it is just what I had envisaged for the 3Doodler on a larger scale. Potentially to be used in construction. Since I first saw the 3Doodler on kickstarter and backed it immediately, I have dreamed that it could be scaled up. Perhaps extruding around a steel cable or carbon fibre core to shape a concrete re-enforcement armature. Building columns and structures with an unbridled freedom of form. 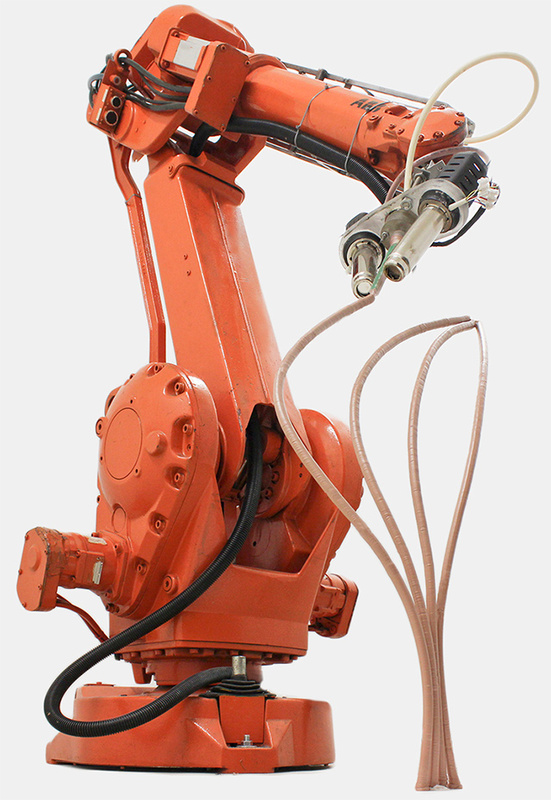 The technology is nearly there already, its almost a combination of the Mataerial robotic extruder and Contour crafting’s 3D concrete extruder. Whilst the Contour crafting rig requires pre-fabricated lintels, the Mataerial extruder could bridge the gap automatically. It could build in a greater level of detail into the basic concrete wall structure. The Mataerial extruder could form mechanical and electrical service openings, mounting for cladding. You could almost print window and door frames directly ready for glazing. The mind boggles at the possibilities. I have a lot more to say on this topic and am dreaming up ways to build and glaze on a large scale. 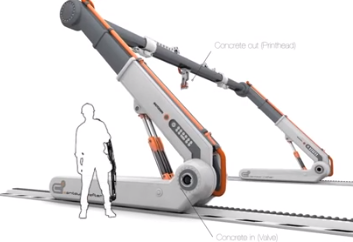 Take a look at my page on 3D Printing in Construction which I think is due a decent update after discovering the Material robotic extruder! Please let me know your thoughts on this. Poke holes in the concepts, lets find the problems and see if we can solve them. I know the strength of the extruded substrate material will be an issue so any suggestions to make it strong enough to support the concrete would be great. Heck if someone can figure out how to fill the armature with aerogel then we could be onto a winner!